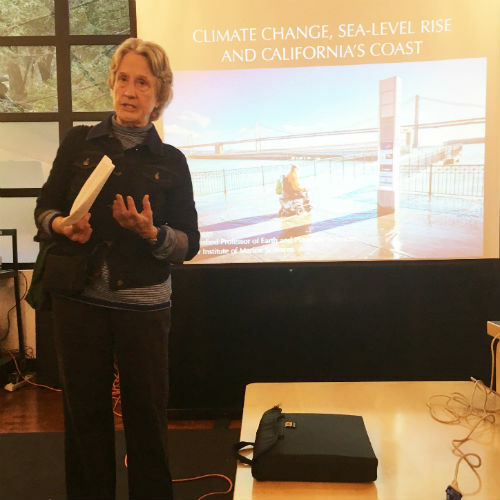 Professor emerita Donna Haraway delivered opening remarks at the first panel of the day, "Climate Change: Scientists Speak Out." Sociology professor Veronica Terriquez led a session "Building Power: the Role of Students, Immigrants, and Workers in Reclaiming Democracy." Anthropology professor Lisa Rofel delivered closing remarks at the Teach-In townhall. The agenda for Teach! Organize! Resist! was clear: to inform the community about the pressing policy issues under the Trump administration. However, the issues and problems are complex. Immigration, religious freedom, economic inequity, participatory budgeting, political activism, and climate science were just some of the many challenging topics addressed by UC Santa Cruz faculty and representatives from community organizations at the all-day teach-in held Jan 18. With experts from UC Santa Cruz and community partners including the Council of American-Islamic Relations, Californians for Justice, Services, Immigrant Rights, and Education Network (SIREN), and the Central American Resource Center SF leading discussions and workshops, these relevant questions were addressed, and optimistic messages delivered. “We have exactly enough time if we start now,” said Gary Griggs, a professor of Earth sciences and director of the Institute of Marine Sciences about responding to the earth’s rising temperature. Grigg’s remarks were part of the session “Climate Change: Scientists Speak Out,” one of nine events that were part of the teach-in. Other discussions included a conversation about what to do at a protest, LGBTQ resistance in the Trump era, and understanding and combatting Islamophobia. 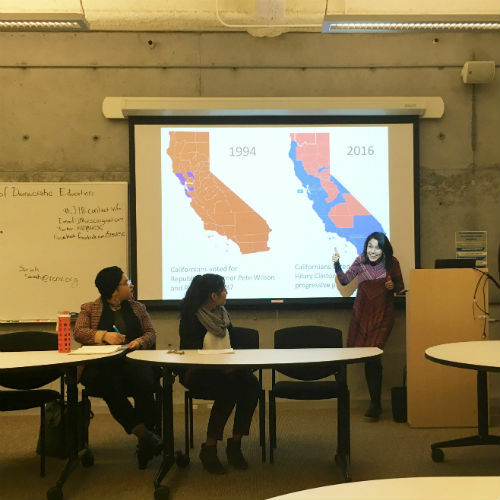 “We have to be proactive,” said alumna Shaila Ramos (B.A., Latin American and Latino studies, ‘15), a youth organizer at Californians for Justice who co-presented the workshop “Building Power: the Role of Students, Immigrants, and Workers in Reclaiming Democracy” with sociology professor Veronica Terriquez. “We have to do things now,” Ramos added. Terriquez suggested that voting is one way to engage, and emphasized that volunteering for a campaign is another way to raise political consciousness. Ramos also advised students do their due diligence when discussing politics and news over social media. Misinformation was one topic sociology professor Lindsey Dillon spoke extensively about. Dillon turned to agnotology, the study of ignorance as a way to explain one reason why climate science remains an unsettled debate. “Disbelief is actively produced,” Dillon said, adding that uncertainty requires cultural work and will to produce. Dillon compared climate denial to the the tobacco industry’s long history disputing the hazardous effects of smoking. “We need to understand the alchemy of ideology,” said Craig Reinarman in closing remarks at a townhall that culminated the day’s teach-in. Further advocating for objective inquiry was Donna Haraway and Karen Barad, who read the unofficial solidarity statement they co-initiated with professor emerita and activist Angela Davis and other faculty and staff administrators from across campus. Other closing remarks included Katy Torres, a fourth-year Latin American and Latino studies major and a mentor for Undocumented Student Services (USS) at the UCSC Educational Opportunity Programs Office (EOP) read the EOP statement on supporting undocumented students. “Opportunity and equity programs like EOP are born out of the struggle for social change. We stand on the shoulders of all those that struggled in the civil rights movement,” Torres read. Associate professor Fernando Leiva and doctoral student Cesar Estrella read the statement from the Latin American and Latino Studies department about the 2016 election results. 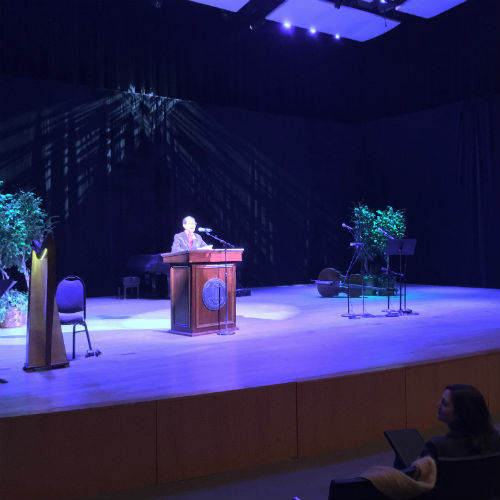 Environmental studies professor Andrew Szasz discussed the importance of unexpected allies and Jennifer Gonzalez from the department of History of Art and Visual Culture read aloud Zoe Leonard’s 1992 poem “I want a president,” a political statement that powerfully resonates 25 years later. Brittany Rezaei, a civil rights attorney from the Council on American-Islamic Relations also talked about religious freedom and the importance of knowing one’s constitutional rights. 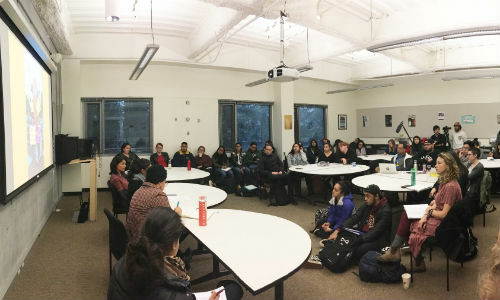 The UC Santa Cruz event was a response to a call for action issued by UCLA Professor Ananya Roy. Numerous faculty have contributed to Teach! Organize! Resist!, including Lisa Rofel and Chelsea Blackmore in Anthropology, Sylvanna Falcón in Latin American and Latino studies, Hillary Angelo in Sociology, instructor Chris Gray of Crown College, and UCSC graduate students Jess Whatcott of Politics and Kati Barahona–Lopez of Sociology.